Natural orifice translumenal endoscopic surgery (NOTES) is a newly developing technology in the surgical field. Methods of gastrotomy closure are still far from satisfactory and pose a major hindrance to the development of NOTES. A new concept of transvaginal and transgastric peritoneoscopy followed by a two-layer endoclip closure of gastrotomy wound is presented. Four pigs were recruited for this experiment. The procedures were performed under general anesthesia. Transvaginal peritoneoscopy was firstly performed. Under direct vision a transgastric gastrotomy and then peritoneoscopy was performed. Closure of the gastrotomy was achieved by application of three endoclips to the serosal surface as well as the mucosal surface. Fluid and gas leakage tests were performed after closure of the gastrotomy with clips. The pigs were kept nil per oral for two to three days. Euthanasia was performed four weeks after the procedure. 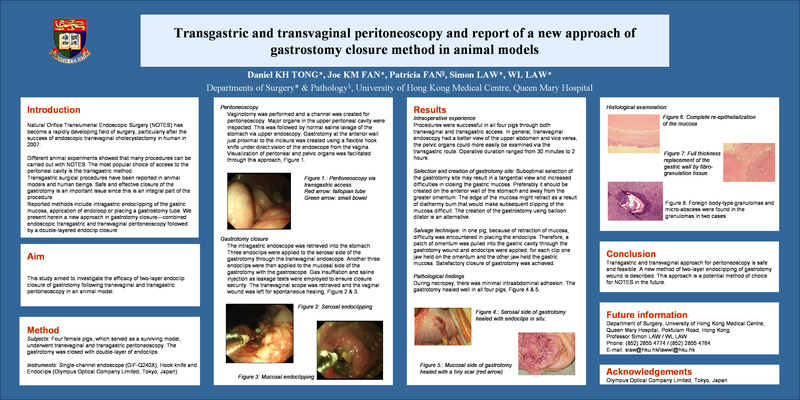 Peritoneoscopy was successfully performed in all four pigs by both transvaginal and transgastric routes. The two-layer endoclip gastrotomy closure was successful in three pigs. In one pig, the technique was not successful due to a poor selected gastrotomy site and a good end on view of the incision could not be obtained. The two jaws of the clip were not able to approximate the edges of the gastrotomy. A salvage technique, which employed a patch of omental plug from the peritoneal cavity, secured with endoclips on stomach side, was able to successfully repair the gastrotomy. All four pigs recovered uneventfully without any complications. Postmortem examination showed complete healing of the gastrotomy in all 4 pigs. Transvaginal and transgastric peritoneoscopy is feasible and safe. Two-layer endoclip closure of the gastrotomy is possible and can be a potential technique in NOTES.